Following a car accident, you’ve heard that you may need to give a deposition. 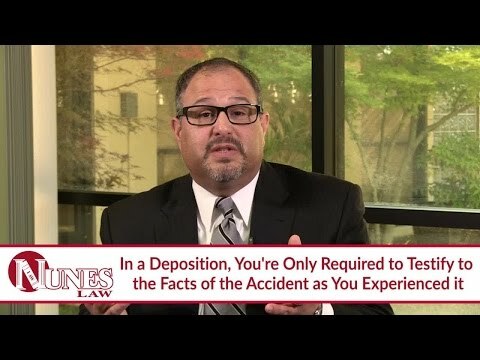 There are a few things you need to know about depositions. A deposition is a question and answer session in which you will testify as to what you witnessed at the scene. A deposition is not an aptitude test. Nor are you required to speculate as to what happened. The question topics are generally far ranging, and could include anything that may narrow the scope or prove an issue in trial. However, there are a few things that are off limits. The most common exception would include questions regarding the conversations you had with your attorney prior to the deposition. That communication is privileged. Watch the video to learn more. If you have additional questions regarding what a deposition is, I want you to call me at (559) 436-0850. I welcome your call. Visit our educational website at www.NunesLaw.comfor more videos and media content from our law firm.